74% of students participate in some form of research during their undergraduate career. 27 Nobel Prize recipients have ties to Johns Hopkins. 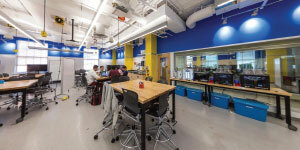 The Biomedical Engineering Design Studio is a facility with group meeting spaces, a rapid prototyping lab, a wet lab, and a student machine shop. The Hopkins Office for Undergraduate Research (HOUR) is our home for supporting and encouraging undergrads in research endeavors by connecting them to opportunities both inside and outside Hopkins. Johns Hopkins Hospital is just a short shuttle ride from campus. 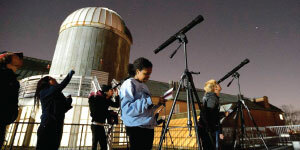 Undergraduates often conduct research here or intern in fields related to their interests. With Pre-professional Advising, students interested in pursuing medicine choose any major/minor combination but follow a pre-med advising track offered through the Office of Pre-professional Advising. PURA, the Provost’s Undergraduate Research Award, offers students up to $2,500 and a partnership with a full-time faculty sponsor for research on any topic of their choosing. Undergraduate Teaching Labs feature an interdisciplinary facility that houses the undergraduate Neuroscience program along with labs and faculty from Chemistry, Biology, Biophysics, and Psychological and Brain Sciences. The Woodrow Wilson Undergraduate Research Fellowship Program offers Krieger Arts and Sciences students up to $10,000 to pursue research projects of their own design starting their first year. As America’s first research institution, Johns Hopkins University is known worldwide for groundbreaking advances in everything from technology to medicine. We’re a leader in health sciences education in part because of a focus on innovation, collaboration with clinicians and industry partners, and an emphasis on hands-on, research-based learning. Whether in the Biomedical Engineering, Biology, or any other program (pre-health is an advising track, not a major), undergraduates at Hopkins thrive in a flexible, interdisciplinary approach that emphasizes experiential learning and collaboration. With access to world-class facilities and large-school resources, pre-health students at Hopkins are dedicated to finding solutions to the world’s most pressing health issues. They’re developing the techniques, procedures, and policies that shape the health care industry and impact patient care—all while undergrads. They take advantage of unique programs and opportunities, often going beyond traditional medical careers, and make a lasting impact on society. Hopkins professors are widely recognized scholars and experts in their fields who are constantly making important contributions to their industries and academia at large. They’ve accomplished impressive feats such as being honored by the CDC for having a transformative effect on injury prevention and control, pioneering the use of electronic medical records in genetic research, and developing novel therapeutic strategies for diseases. They’re enthusiastic about teaching, often including undergraduates in their own groundbreaking research, and are always accessible to advise and assist students. It’s not unusual to brainstorm research ideas over coffee or debate theories during office hours. With schools and divisions throughout Maryland and the globe, the larger Hopkins network is an exceptional resource. 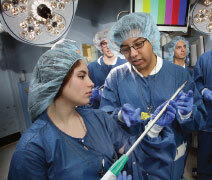 Undergraduates have the chance to take courses and participate in research at other renowned divisions of Johns Hopkins University, including the Bloomberg School of Public Health, the School of Nursing, and the School of Medicine. The Direct Matriculation Program allows qualified students to pursue a combined bachelor’s/master’s degree with the School of Public Health. Through collaborations with local Baltimore-based nonprofits, research in partnership with organizations like the FDA, or the precedent-setting work of alumni, the collective efforts of the entire Johns Hopkins community are remarkable and wide reaching. Each year, the University continues to receive and apply more research funding than any other US institution and provides undergraduates with funding to pursue their ambitions. From finding a way to significantly slow metastasis to investigating the pathways that cause Parkinson’s disease, students here are engaged in profound work.